For everyone waiting for Cascade Lake, Intel’s next server Xeon platform, to be launched, noise is being made from the Power Stamp Alliance and its members about the platform beyond Cascade Lake. Alliance member Bel Power Solutions, along with the Power Stamp website, have exposed several details on the Ice Lake Xeon platform. The first element of the information is the new socket, set at LGA4189. This is compared to the current Xeon socket, standing at LGA3647, which currently supports the Skylake Xeon family as well as the upcoming Cascade Lake Xeon family. According to the documents, the power pin implementation between the new LGA4189 and LGA3647 sockets are compatible via an adaptor: this isn’t to say the CPUs themselves will be, but it would appear that all the Skylake/Cascade Lake/Ice Lake Xeon families will have a similar power implementation. 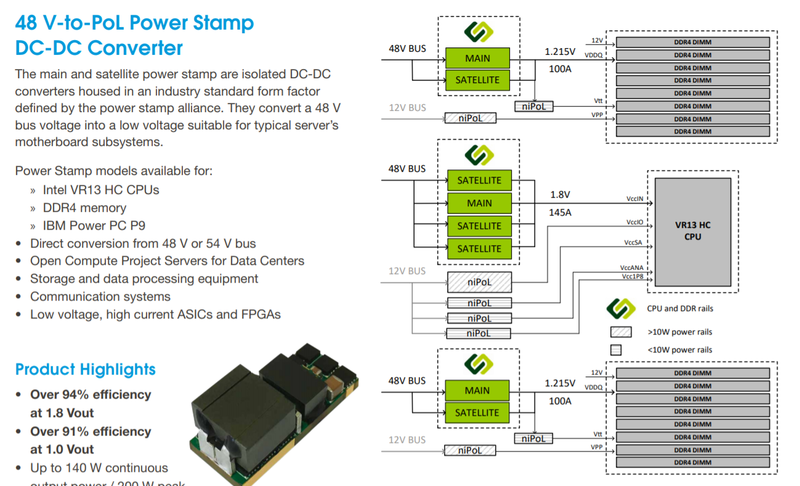 The reason why we mention the power implementation only is because the Power Stamp Alliance (and Bel Power Solutions) is only dealing with DC-to-DC converters for the platforms, driving efficiency from a high 48V input correlating with the Open Compute Project (OCP) standards and deployments. Also in this image (and verified at Power Stamp) are the power ranges for Cascade Lake (165-205W, similar to Skylake Xeons) and for Ice Lake (set to go to 230W). Should the new Ice Lake Xeon platform incorporate features such as OmniPath or on-package FPGAs, which Intel has teased future Xeon platforms to be, then 230W is well within the reasons of possibility. Also, having a high DC-to-DC efficiency is going to assist with overall power consumption and power loss. Delving into the documents, the Power Stamp Alliance designates two code names in play: VR13 (for Skylake and Cascade Lake) and VR13-HC (for Ice Lake). The HC in this case stands for high-current, and the documentation shows ‘a typical’ VR13-HC implementation with two CPUs and sixteen DDR4 memory slots for each CPU. The Bel Power systems documents goes on to say that a VR13-HC system (Ice Lake) with four power stamps meets the VR13-HC minimum requirements, while only three are needed for VR13 (Skylake/Cascade). The images shown above and below point to Ice Lake Xeons being equipped with native eight-channel DDR4, given how Intel dropped 3 DIMM per channel support with Skylake. This comes through the chip directly, rather than implementing memory buffers, such as the Jordan Creek implementation on the E7 v4 family. With the 8-channel design, one might assume Intel boosting the maximum memory capacity of the base Xeon processors from 768GB to 1TB, although we should wait to see if that is going to be the case. If Intel is using the same on-chip network implementation as Skylake, it would also mean that one of the segments that previously used for a tri-memory channel controller actually has enough space for a quad-memory channel controller. No special mention is made regarding XPoint memory support. Parts of the documents state that a set of 8 DRAM slots and two power stamps should be good for 100-200A at 1.215 V for VDDQ, implying that a set of 8 memory sticks should be able to draw around 120W-240W, or ~15-30W each. Varying numbers have been postulated as to the power draw of XPoint modules, but most numbers are within this range. *This article first stated that the OCP Summit was going to happen in Late May. It actually happened in Late March already. I can't shake the feeling that using a 48V bus is a mistake. Nearly all power FETs built today have a 30V Vds max. Using 48V means all new power FETs need to be designed. Isn't PowerPC (Power9) already 48v? CPU Power "Stamps" have been an IBM trademark since PowerPC G3's where the FET's, voltage conversion (and external cache - a norm at the time...) were on the same PCB. This greatly simplified motherboard architecture and allowed for some pretty ridiculous life cycles. 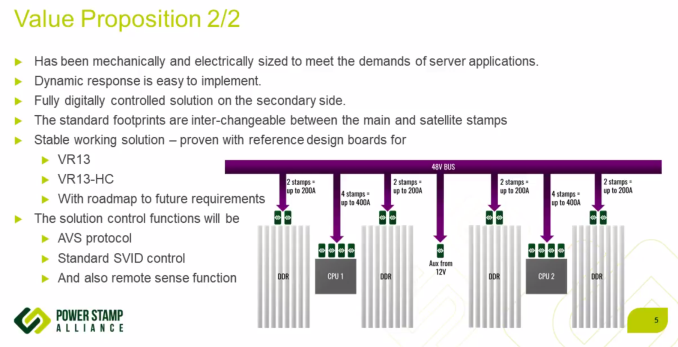 For those interested in the refinements of power electronics and the topology issues mentioned above, here is a link to the commentary at the recent Rap Session 1 at APEC 2018. I am just not impressed by Intel's new servers, and Intel's engineers should know better. But apparently they do not. Certainly the acumen of organizers of the recent APEC 2018 conference leaves a lot to be desired, where profit rules over common sense. The real problem is consumers pay for a huge number of ferrite cores, MOSFET power stages and controllers, when a much smaller footprint at a small fraction of the cost would increase both manufacturer's profitability, as well as eliminating substantial heat for a significant reduction in motherboard cost. Lackadaisical engineering prowess places the cost at the consumer big time. Imagine 12 phase Buck VRMs with 12 ferrite cores are reduced to zero, where inductors with resonance scaling are reduced to 10nH as 5mm copper traces on the motherboard. That is a very big deal in cost and effort, with ceramic capacitors eliminating the larger capacitors. Intel does not bet per se, they are just victims of really bad practices, and Intel is not alone in this.